Cold day today. Geoff couldn't get his car started this morning because ice had clogged up the ignition. By the time we successful thawed it and rolled away, the outside thermometer read -1, with a bright sun rolling over the southern mountains. It was just after 12 p.m.
We have been doing a lot of cross-country skiing this weekend. Today was a short trip around the groomers near town. 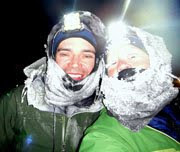 I ran behind Geoff and Craig on snowshoes, breathing so hard that my eyelashes froze - hence the self portrait above. 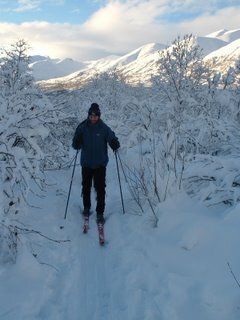 Yesterday we drove up to Hatcher Pass to ski along the "Little Su" River. The trail rose ever so slightly, and we didn't even really notice we were climbing much until we looked back to a lateral view of snow wafting off the mountains. The trip went long, and one guy we were with eventually dropped out. But the ski down was exhilarating, with enough gravity-forced sliding to finally stop Geoff from saying "Hey, Jill, I think you forgot that you're skiing again." We did run into a couple of friends from Homer on the trail. 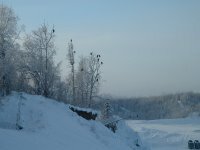 They invited us to their family's home in Wasilla for what turned into a second Thanksgiving dinner. A house full of strangers welcomed us in like one of their own, and filled us with starch and stories of the local color-variety (many of them hailed from Homer.) The evening had the same sweet sensory overload that really makes Thanksgiving feel complete - sitting on the couch as plates of pie and hot chocolate are shoved in your face from stealth angles, all the while lost in a tangle of multiple conversations illustrating people you don't know and places you've never been. Then, to top off the experience, I even got the "How old are you now, sweetie?" comment from Grandma, albeit somebody else's grandma, but it still made me feel nostalgic. Sounds like a blast! I miss the North Slope people from around Deadhorse and Coldfoot! Greetings! Your images look so gorgeous... I've always hoped to move to Alaska some day, but for now I'm still wandering. I'll be sure to pop back in so I can enjoy Alaska vicariously through you. Have fun on your new adventures! Gah! The eyelashes! I hope to try skiing next year; it's killing me this year with all this snow that I can't go tubing. Pepsi is good, Especially after you had to work for it. Looks like some great skiing up there; very cool pics. Came across your blog because you were listed at Blogshares. 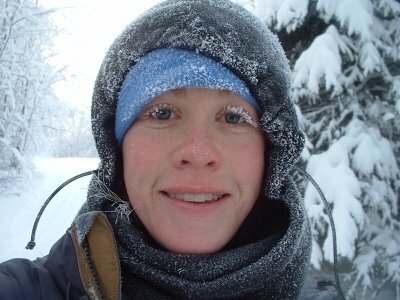 Hehe, I have a strikingly similar photo of myself all frosty-eyed. I took it last winter in a moment of pride at Alyeska. I've been meaning to snowshoe at Hatcher Pass soon, so thanks for the motivational pictures!